Coconut is one of my favorite flavors in the whole world. Besides chocolate, I think I could safely say it is a baking staple. If there are a selection of squares to choose from, I will always pick one that contains coconut. Cookies or cupcakes? Definitely one with coconut. 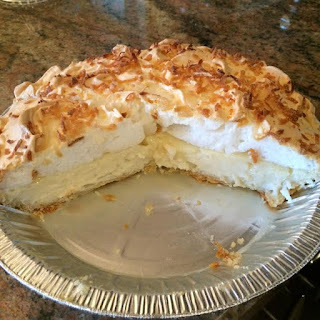 So, it sort of boggles my mind a little bit that I have never, ever, in my history of baking, attempted a coconut cream pie. I guess there are a couple of reasons for that. First, my household does not embrace the delicious world that is pie. My husband is pretty "meh" about all pies except for lemon meringue. He's also keen on Flapper pie (basically a sweet custard pie) made by his grandma, but that's about it. No one in my house likes any sort of berry pie. Apple also isn't a winner. When it's Thanksgiving, I basically take down a pumpkin pie on my own. 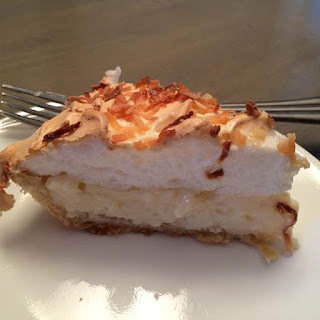 The second reason that I've never attempted a coconut pie is that they are either a custard base (which I previously found too daunting), or a pudding and whipped topping combo (which I kind of think of as a cheaters way to bake). Don't get me wrong....I cheat sometimes too. Pudding has it's place, but it just never seemed appealing in coconut form. 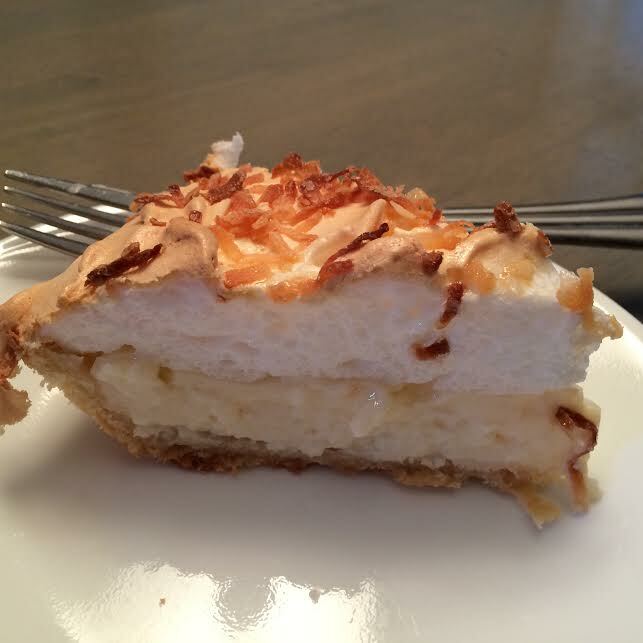 When I recently came across the recipe for this version of the pie on the Taste of Home website, I thought it was time I give the coconut cream pie variety it a whirl. We were having a dinner guest that night too, and I know his love of pie is right up there with mine. At least someone would overeat with me if it turned out to be a winner. It's nice to have someone else to shame spiral with. Here is the link to the original recipe: Coconut Cream Angel Pie. * Yes, I cheated and used a frozen one. However, you could use a halved version of the pastry recipe found in my post for Autumn Apple Pie. -Remove from the heat and stir in the coconut, butter and vanilla extracts. This is where I branched out and added some coconut extract. Pour into the pre-baked shell. Beat egg whites, cream of tartar and vanilla until soft peaks form. Add the sugar and continue until peaks stand on their own and are nice and glossy. Gently spoon onto prepared pie, spreading over the edges of the pastry to seal in the filling. Sprinkle with coconut. Bake in a preheated 350F oven for between 17 to 20 minutes (I went almost the whole 20), or until golden brown. Allow pie to cool on a wire rack for approximately one hour. Refrigerate for at least 3 hours before serving. Oh my!!!! That pie looks fantastic! Totally inspired, I will have to try it soon.